Choosing green cleaners can help prevent exposing your family to harsh chemicals at home. Today's new specialty surfaces give us myriad choices for floors and counters. But cleaning them poses a problem, especially for those of us who prefer eco friendly house cleaning products. Fortunately there are manufacturers keeping pace and creating new, "earth-friendly" cleaners. Now we can keep such germ-magnet rooms as the bathroom and kitchen clean without endangering the family. The key to safe cleaning is providing adequate ventilation, wearing gloves and avoiding eye exposure to cleaners and fumes - "natural" or otherwise. These chemicals can cause eye, nose and throat irritation, nausea and headaches in the short term. Long-term exposure can damage the liver, kidneys and the central nervous system. So which products should we be looking for? This surface-specific guide can help you choose the right eco friendly house cleaning products for the job. Cast iron sinks. To safely clean cast-iron sinks and lavatories, rinse with water and dry thoroughly after each use. 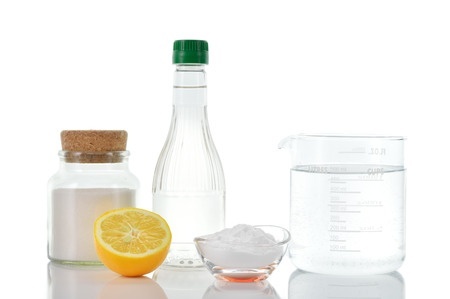 For stubborn stains, abrasives such as washing soda and borax are a good alternative to chemical cleaners, and a lemon half can even be used to scrub out mild stains. Scrub ceramic tile floors and countertops with a nonabrasive natural cleaner such as baking soda mixed with water. Ceramic tile. Scrub ceramic tile floors and countertops with a nonabrasive natural cleaner such as baking soda mixed with water. Rinse thoroughly with clean water. The easiest - and safest - way to keep tiled shower walls clean is to wipe them down with a towel after each use. To clean stained or mildewed grout, apply diluted bleach (3/4 cup bleach to 1 gallon of water) and rinse thoroughly. Marble. Avoid using acidic or abrasive cleaners on this delicate, highly polished surface. Also, avoid spilling acids on marble, as pitting and staining can result. Wipe up spills immediately, and use a product formulated for cleaning marble, such as Marbamist from Stone Care International, Inc., available online at Amazon.com and other retailers. Laminates. For those who don't mind extra scrubbing, vinegar and water work well for general cleaning of laminate flooring and countertops, as does liquid dish-washing detergent and water. To remove tough spots or stains, buff the blemish with acetone name polish remover, then wipe clean with a damp cloth. To kill countertop germs, use a nonabrasive disinfectant weekly, such as a bleach and water solution. Vinyl. Vinyl floors often require only regular sweeping and damp mopping with water. But for those grimy jobs, a cleaner with a surfactant will provide uniform cleaning and drying. For regular weekly cleaning, use a water-based, neutral cleaner. Hardwood floors. Whether yours are oak, maple, ash or beech, cleaning them is as safe as it gets. Simply vacuum or dust mop once a week and wipe up spills immediately - standing water can warp wood. Avoid oil soaps; they can build up and create problems. Instead, neutral pH cleaners made specifically for wood floors are best. Solid surfaces. Solid surfaces withbrand names as Aconite and DuPont Corian are among the most popular for kitchen counters and backsplashes. These surfaces should be cleaned with a damp cloth and ordinary household soap or a non-abrasive mild cleanser. For extra safety in the kitchen, disinfect countertops weekly using and EPA-certified disinfectant or a bleach and water solution that is safe for the surface. Green Cleaning Products: How Safe Are They?